For the tzatziki, mix all the ingredients and let sit at least an hour before serving. Start the burger patties by sauteing the onion in the butter for about 25 minutes until very browned. Meanwhile, grate the carrot, mince the garlic, rinse the quinoa, and strain and rinse the beans. Mash the beans until somewhat smooth with some chunks. Mix the egg and sriracha into the beans. When the onion is ready, add the carrot and cook another 5 minutes. Add in the garlic and the quinoa and cook for 1 minute, just to lightly toast the grains. Stir in the water. Bring to a simmer, lower the heat, and cover. Cook for about 20 minutes until tender and fluffy. Allow the quinoa to cool. Mix with the bean mixture and let it sit about 15 minutes. The quinoa mixture will be a little too wet to form it into patties. The best way to continue is to use an ice cream scoop to dish out scoops of the mixture directly onto a flat grill or frying pan. Cover to help cook through and allow the egg to bind. After about 10 minutes on the first side, very gently flip the patties. Cover and cook another 7 minutes or so. Gently place the patties onto the buns and serve with tzatziki, arugula, and sliced red pepper. It’s no wonder quinoa has gotten so popular in the past few years. Not only is it super healthy and delicious, it’s also crazy versatile! I've used it in soups, stews, and risottos, and as a replacement for rice, pasta, polenta, oatmeal…and now meat! These Quinoa Burgers are a perfect place for the supergrain to shine as a meat replacement. They not only come out juicy and tender, they’re packed with protein and have a meaty flavor from caramelized onions. Just serve with an easy tzatziki for a healthy and satisfying vegetarian meal. Tzatziki is super simple when you use lemon-flavored Greek yogurt. Just mix these four ingredients, add some salt and pepper, and call it a day! The burger patties take a little more work, but they are oh-so worth it. Some eggs and sriracha get mixed into the mashed black beans. It basically becomes delicious glue. Cooking onions down to a nice golden brown really gives these burgers a meaty flavor. Carrot, garlic, and raw quinoa go in next. Toss in water and simmer for about 20 minutes. The quinoa mixture gets mixed in with the bean mixture. Many recipes for quinoa burgers include breadcrumbs, but I think there’s enough bread and grain in this meal already. Because we aren't using breadcrumbs, this burger is gonna be soft. This makes for a super tender and juicy final burger, but you need to be really careful handling it in the frying pan. Instead of forming patties now, scoop out some of the mixture with an ice cream scoop and form the patty in the grill. Cover and let sit for about 10 minutes before very gently flipping. If the top cracks a little it’s no big deal, just keep it together. It will firm up a little more before it’s done cooking. 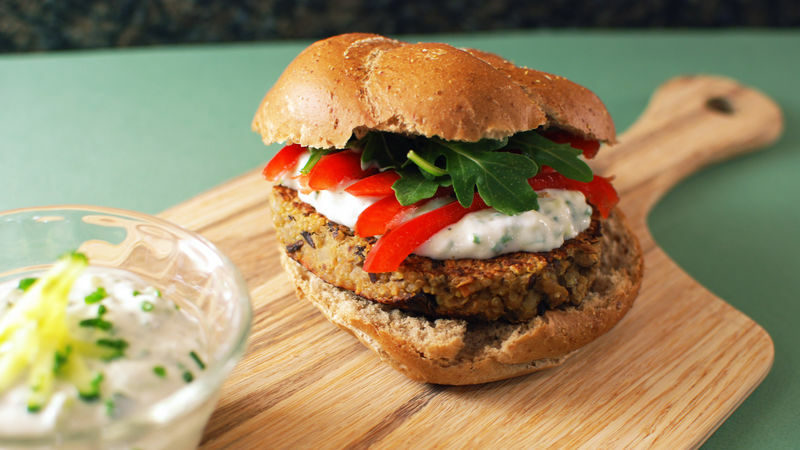 Serve on a nice whole grain bun with some of your tzatziki, red peppers, and arugula. Enjoy! Dan Whalen thinks the only logical next step for quinoa is dessert. He has been blogging for over 4 years at The Food in My Beard; check Dan's Tablespoon profile often to try his recipes with creative international spins!